This Thanksgiving, I knew I couldn't do much to help the meal planning. We were planning to arrive the day before the big feast, and it turned out weather delayed us until the morning of -- not to mention the turkey and sides have been traditionally taken care of by my new in-laws, and I didn't want to step on anyone's toes. However, I had some beautiful, hand-picked cranberries (from my mom, plucked from the cranberry bogs of Whidbey Island) that I really wanted to do something impressive with. I also had just found a recipe that has a slightly embarrassing origin but is *delicious* (more on that in a second). Pear-y, marzipan-y, even good as two-week-old leftovers (says the baker who admits to eating the last piece from the trial batch two days ago). I initially made it with a cake pan, the kind that has the little bar you move under the cake to loosen it after it has baked, and that was OK, but the one I made in the tart pan with the removable bottom was pretty much the star of the show (I do recommend that you fold the edges of the pastry over the top edges of the pan; otherwise, during prebaking it shrinks in too much). My father-in-law requested -- nay, insisted -- I leave the leftovers with him. So that was one successful dessert, but it hadn't taken care of the amazing, tiny, tart cranberries. For that, I turned to the intertubes. I'm honestly not much of a baker. I've gotten into bread moods, and even received the very good Bread Alone cookbook as a gift (though not used it nearly as much as I'd like to). I'm still intimidated by baking and its precision. Therefore, it shouldn't come as a surprise that I've never made a cheesecake in my adult life. But that didn't stop me from thinking that cranberry would be a good combination with cheesecake (that is, after I rejected the implausibility of traveling with and/or making in small portions and without a reliably available oven, cranberry creme brulee. I still *need* to make that). And the good old intertubes came through again, giving me this recipe, which AllRecipes.com apparently purloined from Taste of Home. It's really good. Really full of cream cheese, and really good. 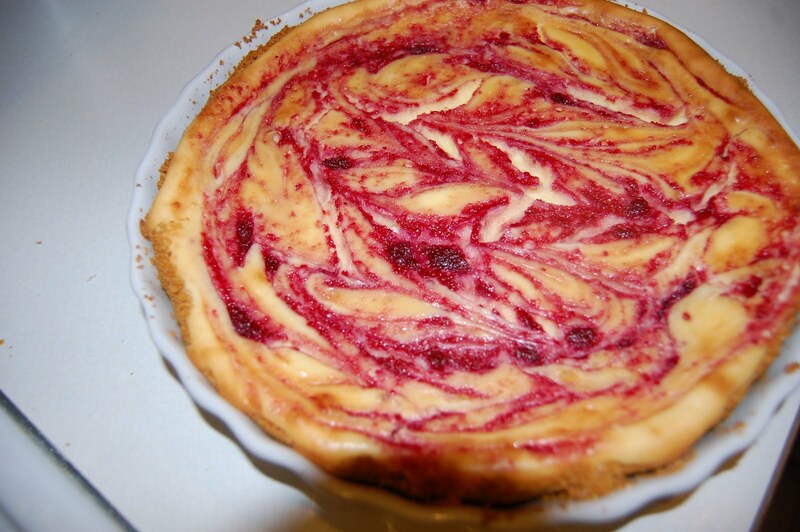 I used a little less sugar and a little more lemon juice because I wanted the tartness of the cranberry to shine. Additionally, the sides of the pan were so low (do I have the wrong kind of pan?) that I had to swirl the cranberry directly into the cheesecake, not leaving the layer of sauce on top that is shown in the AllRecipes photo. It looked pretty awesome, although the cheesecake did crack, which I had understood the sitting in a cooling oven is supposed to prevent. 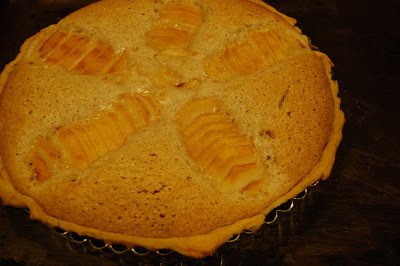 As it turned out, it tasted pretty awesome too, a run for the money with the pear frangipane. So. If you have in-laws, bosses, or other discriminating folks to impress this holiday season, these two desserts are what I suggest. If you're so lucky as to be stuck with the last course, that is!